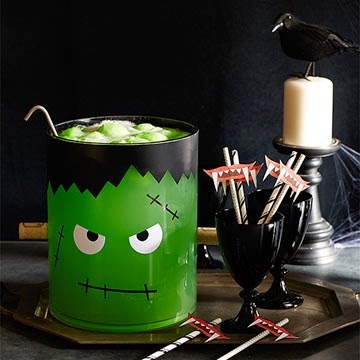 I saw this cute Frankenstein Halloween Punch in the Rachel Ray Magazine. I will now be looking for a cylinder punch bowl to add to my collection. If you don't have one you can always make these cute little Frankenstein punch cups with the same lime punch recipe. No punch bowl required. Hi I just wanted to say a quick thank you for hosting the linky party. And to let you know I love your blog name. :-) I have been pinning a lot of Halloween ideas lately and your Frankenstein cups are too cute.